Primrose, Primula vulgaris, basking in spring sunshine. Photo: Paul Kirtley. The primrose is amongst the first flowers of spring. Indeed this is where the name derives from – prime coming from the Latin primus for first, prima rosa meaning ‘first rose’. 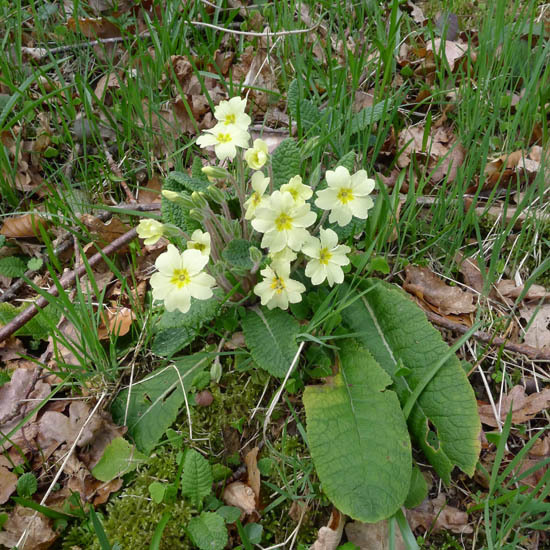 The primrose is widespread throughout the UK and Europe. It is a locally common plant of open woodland, banks and verges. This plant produces a rosette of crinkly tongue-shaped leaves, with the flowers growing from the centre of the rosette. The flowers of the primrose are quite unmistakable – pastel yellow with five petals, with a darker yellow centre. Each flower is a lone individual on a hairy stem. Primrose, Primula vulgaris - distinctive flowers and tongue-shaped leaves. Photo: Paul Kirtley. Primrose, Primula vulgaris - crinkly leaves. Photo: Paul Kirtley. Primrose, Primula vulgaris flower and stalk detail. Photo: Paul Kirtley. 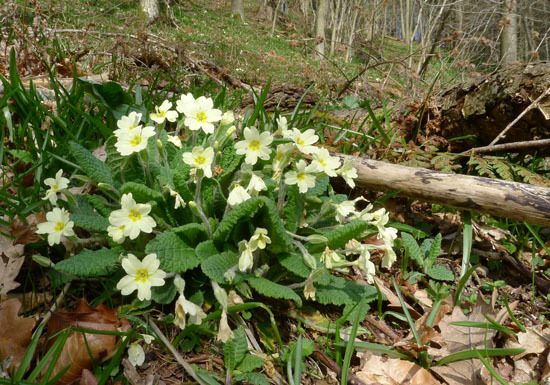 In wild food books the flowers and leaves of primrose, Primula vulgaris, are often described as edible – the flowers raw and leaves raw or cooked. I have eaten both flowers and leaves raw with no ill effects. BUT there is research that suggests handling the plant might cause contact dermatitis in some people. A cultivated relative, Primula obconica, more commonly known as poison primrose, is well known as the cause of many cases of allergic contact dermatitis. The suggestion is that species of primula other than P.obconica may cause reactions more frequently than is reported. 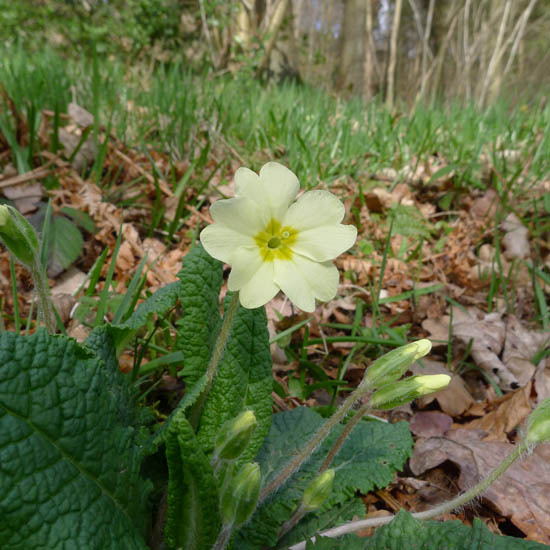 If you do decide to try primrose, then please only take a few leaves from any particular plant so as not to damage it too much. Please read the BSBI’s Code of Conduct for the Conservation and Enjoyment of Wild Plants for guidance on best practice. This article is meant only as a guide and is largely a record of my recent forages. It is not a complete treatment of all edible plants that might be available. Nor does it provide a complete treatment of all poisonous plants that may also be present in the habitat where you find the above-mentioned plants. If you want to learn more about plant identification you should invest in some good field guides. The safest way to learn about edible wild plants is for someone who already has the knowledge to show you in person. Any foraging you do on your own is at your own risk. The most important thing to remember when identifying wild foods is: IF IN DOUBT, LEAVE IT OUT! In Netherlands and Belgium very rare and protected. A nice article with information I never knew before about the dermatitis. 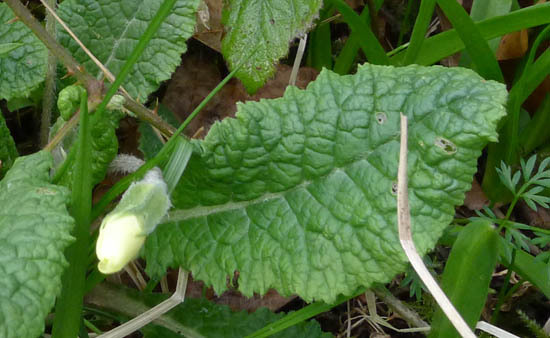 The things you know, to eat a wild primrose. I know willow is good for you if your in pain. but how to apply it. I’m glad you found this article informative.